The most striking peculiarity of Chiaravalle is the absence of a public square, which is unusual for an Italian village. Actually, there is a central space, but it is used as a parking lot. The absence of a central square is a fundamental sign of the fact that Chiaravalle is not a typical Italian village. From outside, the district can be easily perceived as a bucolic place, an urban and functional unit. Actually, Chiaravalle is a commuter town, moreover a risk area, instead of a place where is possible to live a pleasing and cultural experience. A sense of resignation and struggle is diffused among the inhabitants because of the lack of cultural public spaces (of a public or private library, for instance), the ineffectiveness of event communication campaign of some local associations, only addressed to their members, and the frequent thefts. In response to this situation, Chiaravalle is now living a transformation process thanks to some active citizens who decided to move there to exploit the benefits this place offers in terms of quality of life. One of these citizens is an entrepreneur – “Strade Bianche” company – who decided to give part of its property to build the missing square, participating to the “Borgomondo per Chiaravalle sostenibile” campaign. Thus, DisPlace is situated in a private area, temporally granted, of about 300 square meters. The aim of the square is to host temporary events during the summer, able to welcome people in a place for relaxing, reading and sharing moments, and addressed to all the community. The goal is to “create” a shared project, able to connect, instead of separate, people and going beyond the inner community divisions. 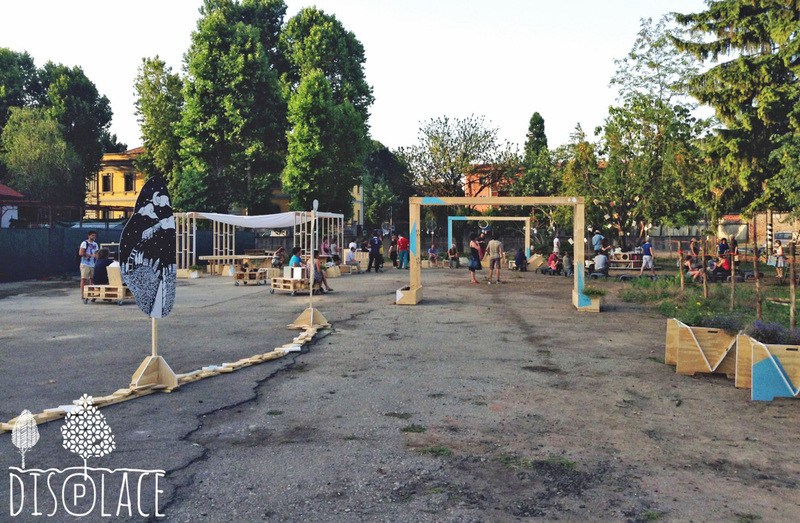 DisPlace is an interior design project belonging to a bigger campaign called “Borgomondo per Chiaravalle sostenibile”: an urban regeneration initiative, which aims to create a sustainable cultural district in the city of Milan. This campaign is founded and supported by three cultural local associations: “Imondidelmondo” by Daniela Rocco, “Terzo Paesaggio” by Andrea Perini and “Odemà”. The Politecnico School of Design has been involved in order to define the square itself. A group composed by BSc design students and coordinated by design professors and researchers (Agnese Rebaglio, assistant professor – Luigi Brenna, adjunct professor and Annalinda De Rosa, research fellow), conducted a 3 months co-design process, till the building workshop. Since the beginning, the inhabitants of the suburb were actively involved in the co-design process (from the design phase to the construction one): they are the main beneficiaries of the space, which is meant to host summer events and activities organized by the main promoters, the three local associations. DisPlace has been supported by Municipality of Milano, Zone 5 Council (patronage), Fondazione Cariplo (cultural competition), Politecnico di Milano – School of Design (technical sponsor and tutor for the design process), Depur-Depuratore di Nosedo (technical sponsor), Locanda Chiaravalle (technical sponsor) and Strade Bianche. “Strade Bianche” is a local entrepreneur company that granted part of its property for the project. Design is involved in the project in a transitional way: it attends the campaign after a previous phase of active presence of the associations promoters in the community. It acts as a contributor, accomplishing its in-between role of starting from the needs of a place to design a solution for its community, implementing the potentialities identified. The seasonal (June to September) transformation from an empty space into a temporary square could show the potential of a participated design action in fostering a community. Moreover, it would prove the ability of the project, and of its actors, to create a symbolic and meaningful place starting from the emptiness of a useless land. That is why the local associations contacted the Politecnico di Milano to collaborate in the urban regeneration of Chiaravalle. Communication tools have been designed in order to collect ideas, desires and suggestions about possible contents and meaning of the future square. Participatory practices have been fundamental in the elaboration and in the realization of the project itself. In fact, the final layout was conceived to be always movable to give final users the opportunity to create their own set. The square is meant to be an interactive place that invites users to participate through a process of discovering, eventually enabling them to build and compose different interior spaces according to their needs. Thus, from a design point of view, empty spaces are a challenging occasion to co-build meaningful places thanks to a design driven action.